Most people aren’t aware of it, but periodontal or gum disease is a common serious problem in dogs. Good oral hygiene is not just limited to humans, so today I am going to discuss how to brush dog's teeth. Brushing dog’s teeth is an essential part of good oral care for your K9 family member. Oral hygiene is also important to your dog’s overall health just as it is for humans. What to Brush Dog's Teeth With? Pet stores carry dog toothbrushes along with other specially made devices for brushing dog’s teeth. You can also wrap a piece of sanitary gauze around your finger and use it to clean your dog’s teeth. It is important to choose something that not only you are comfortable using, but something your dog is also comfortable with. Training your dog to accept this as a normal routine can be a big help in the teeth cleaning process. Can I use Human Toothpaste? Using human toothpaste on your dog’s teeth is not a good idea simply because it ﻿﻿contains fluoride﻿﻿, which is toxic and can be fatal to your pet. When ingested in a large amount, this may upset his stomach, inflamed his intestines and may lead to death, so it's definitely not good for your dog. Pet stores and veterinarians carry special toothpaste just for your pet. Pet toothpaste comes in many different flavors including liver, chicken, peanut butter, and even mint. You might need to try a few different flavors to find out which one your dog prefers. As stated earlier in this article, training your dog to accept this as a normal routine can greatly reduce stress on yourself as well as your dog. The earlier in the dog’s life you start, the easier it will be. 1. Start out by letting your dog get comfortable with you, gently grab the muzzle with one hand under the chin, and the other hand on top of the muzzle. This action should be like you are inspecting his teeth. This step should be repeated several times with a reward at the end each time. This would also be the perfect time to find out what flavor of toothpaste your dog likes and reward him with licking some of the toothpaste from your fingers. 2. ​Gradually progress from your dog licking your fingers, to getting him comfortable with having your fingers in your dog’s mouth. ​3. Once you have worked up to the point of getting your fingers into his mouth, gently rub the teeth and gums. 4. ​Repeat this process several times as in step one. Your dog will eventually get used to this procedure. 5. ​Once you have your dog trained to accept this intrusion of his mouth, it is time to introduce the instrument you plan to use to brush dog's teeth. As in the initial steps, you will want to repeat this several times using treat reinforcements. 6. ​Before trying to introduce any instrument into your dog’s mouth, you will want to be sure to have your dog on a leash. This can be a complicated process, and your dog may want to run or try to take the brush from you. 7. ​Start slowly when first brushing dog’s teeth beginning with the outer part of the teeth first and gradually working up to the inner parts. ​It is important to realize that this will take some time and a lot of patience. Several weeks or even months may be needed to train your dog in the tooth brushing process. Just as in any dog training, reinforcements are a positive thing. Let your dog know that he will be rewarded for cooperating. Teeth cleaning treats are an excellent way of rewarding your dog. Reserving a special treat for this occasion can also be a help. Your dog will recognize that after brushing his teeth, he will receive this special treat it does not get at any other time. Just as humans brush their teeth on a daily basis, it is a good idea to brush dog's teeth daily. If you have a busy schedule, and you can't do this as a daily routine, it is recommended to brush dog's teeth three times per week or every other day. Teeth cleaning treats or chews can serve well as a substitute for daily teeth cleaning and can prevent plaque on a dog’s teeth. Be careful not to get too complacent about brushing dog’s teeth. All your training efforts could be wasted, and your dog’s health is also at stake. 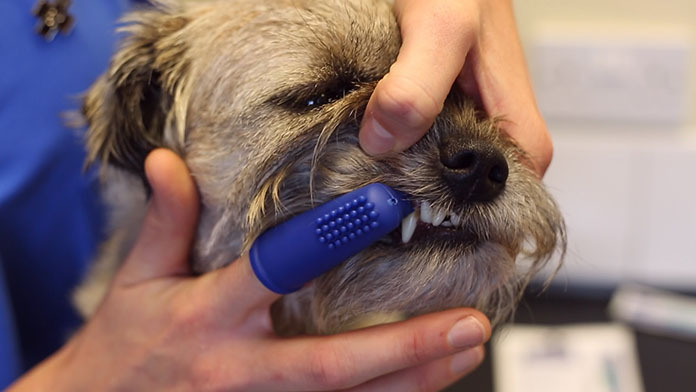 How often should I have my dog's teeth professionally cleaned, and how much does it cost? It is recommended that you take your dog in for an annual dental checkup. This is a good time to have your dog’s teeth professionally cleaned. The Vet may use anesthesia for the checkup, so this is an ideal opportunity to have him clean your dog’s teeth. 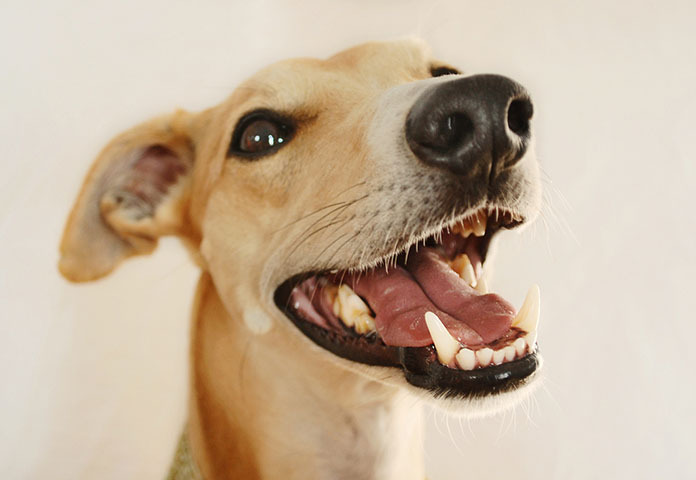 The cost of having your dog’s teeth professionally cleaned can vary from $70 to $350. The cost mostly depends on the caliber of Veterinarian you choose, and the geographic location. A person in Beverly Hills will pay a lot more than someone in Cleveland. 1. Train your dog as early as possible. It is recommended to start the training as a puppy. 2. Use positive reinforcement only. Negative reinforcement will only produce negative results. 4. Be consistent, just like any other dog training you must not be lax in your efforts. 5. Seek professional help if training your dog becomes too difficult. Not all dogs can be easily trained. Why is it important to brush dog's teeth? It is estimated that more than 85% of dogs over the age of 4 years suffer from some sort of periodontal disease. Periodontal disease can lead to other health issues. It is important to learn how to brush dog’s teeth for the health of your extended family member.